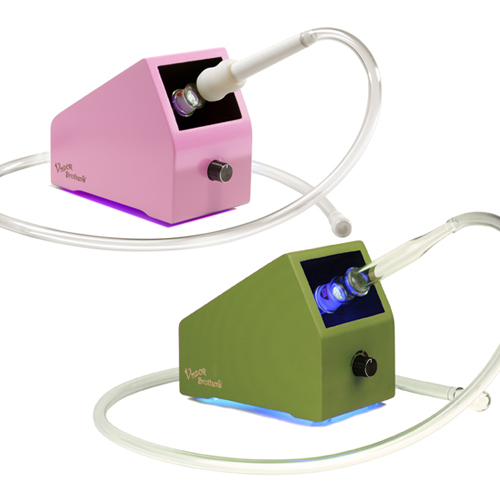 Continuing the mission of the original Whip style vaporizer is a color series using ecologically sound powdercoating techniques to create a durable oven cured coating without any use of solvents or thinners. Enjoy Vaporbrothers' legendary performance in color! Our vapor boxes give better results than units costing 3 times more! Vaporbrothers invented its first herbal vaporizer in 1999 when the world was largely unaware of vaporizing's potential benefits. We operated on principles of creating the best quality vapor from a simple device with no moving parts or noise. Throughout our early years, we demonstrated to the public that vapor could be more satisfying and effective than smoking. Since then, our iconic angled box and glass on glass "Whip" hand piece has become one of the most recognizable vaporizer types in the world. The heater and the vapor chamber at the core of the Vaporbrothers are sized and proportioned for strong and sweet tasting clouds requiring very little material to operate. Competitors using off the shelf connections (18mm) do not have this efficiency or effectiveness. Our glass and ceramic components are always well made, consistent and durable. We inspect 100% of our product, even literally under a microscope at times. Vaporbrothers ceramics are similar to porcelain but about 5 times stronger. All Vaporbrothers Vaporizers feature our exclusive Natural Mineral Heater - an extremely dense and non porous ceramic material that does not expose you to hot metal or other questionable materials. It is the worlds first ceramic heating element custom designed for vaporizing. We use laminated birch wood and finishes from European sources to ensure they conform to the world's highest standards for chemical exposure. All Whip tubing and silicone parts are medical grade. Since components of this unit are extremely hot, these are essential requirements! Dependable Product Warranty - true protection that only an experienced company can provide. We take guarantee your vaporizer will work for 5-10 years - If it becomes truly obsolete or unfixable we will help you get a brand new unit at an extreme discount not offered anywhere else. 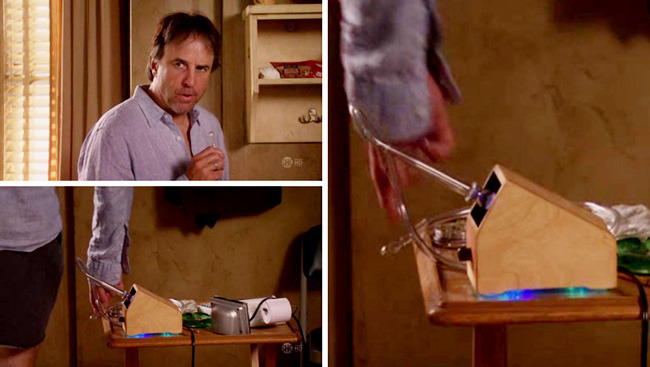 This vaporizer is a Hands-Free model. 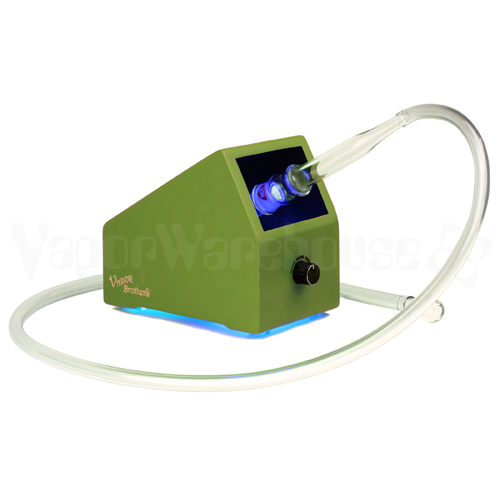 The Whip Handpiece stays attached to the vaporizer without requiring you to hold it in place. All Hands-Free models employ a precision ground glass connection between the vaporizer body and the handpiece. If you are wondering which type of vaporizer to get, the Hands-Free is at a marginally higher cost, but is preferred by new users 10 to 1. VAPORBROTHERS® distributes our products exclusively through authorized and trained distributors and dealers. Occasionally, individuals or discounters will attempt to sell products online without the consent of VAPORBROTHERS, and without the service or support that we require. Any VAPORBROTHERS product purchased from an unauthorized dealer or other unauthorized source can be serviced under our warranty, but may require a fee to cover the difference between the discount price and our minimum allowable price. Vaporbrothers Vaporizers come with a limited lifetime warranty for manufacturer defect. Used vaporizers (over 1 year) can be refurbished for a low flat rate set by your warranty. Vaporizers may be sent to our repair address in California where we rebuild them and test that they work like new. We routinely fix vaporizers over 10 years old and offer trade-in options as well. Read the complete warranty fine print here and don't hesitate to ask us anything at our contact page. Have had the hands free unit for almost four years and it has worked perfectly. I turn it all the way up to warm up for about five minutes then back it down to the 10 o'clock position for use. Works beautifully! Have had this a few years. The temp control could be finer. It seems to run hot and I no longer turn the control dial up, just flick it on.